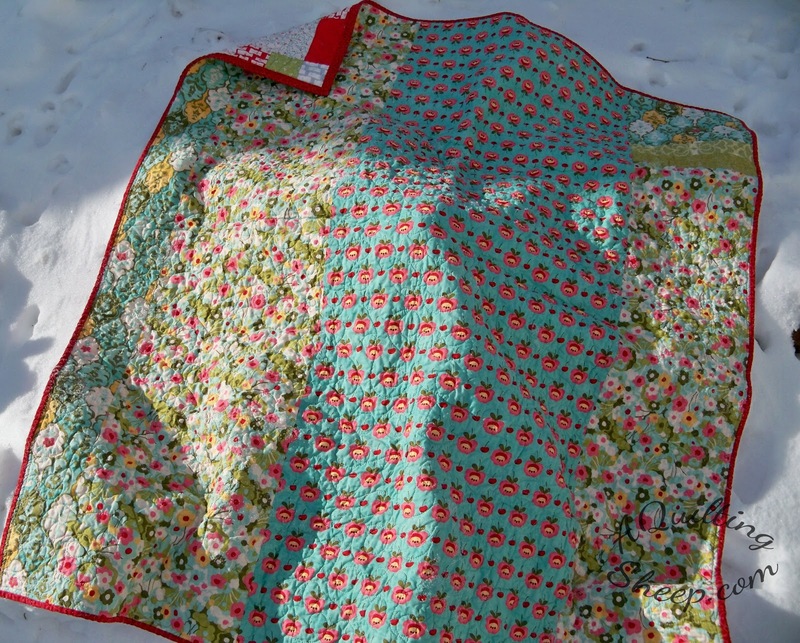 Much of Christmas Day, I spent on the long arm quilting these two quilts. This quilt is for my sister-in-love, Marci. Most of the fabric are scraps left over from the Triangle quilt. I like the randomness of it. It's fairly large at 78"x78". That was made from a layer cake of Cherry Christmas. It's a nice sized baby quilt. I have no plans for it yet. The back fabric all came from my stash. It's so liberating to see the piles of fabric go down in my stash. That's one of my big goals this year, to do some stash busting, either by sewing quilts up for charity or selling, trading, giving away fabric. I do not want to be a fabric hoarder. That said, I am not going so far as to not allow myself to buy fabric this next year, but I am going to be much more selective and thoughtful before I purchase more than a fat quarter. 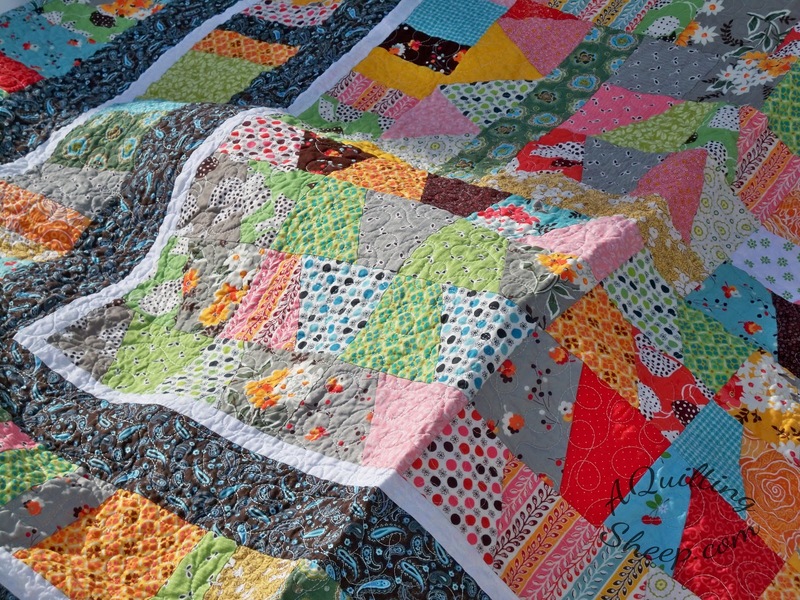 What are your quilting goals this next year? Nothing scrappy about those 2 beauties! What lovely work:) We take the same approach to Christmas as you. We actually had hamburgers for out Christmas dinner. Your day sounded good to me...and how can chili be bad!! !Love your quilts and how about that snow!!! Sounds like a great day with family. Your quilts are gorgeous. I am in love with both. The back you pieced together in fab. I have not done that yet but it is a great idea. Maybe that is how I can get some of my stash down. I like your relaxed approach to the holidays. Makes Christmas more meaningful. Your quilts are absolutely gorgeous! Thank you for sharing these beautiful works of art! It sounds like you had a wonderful day! 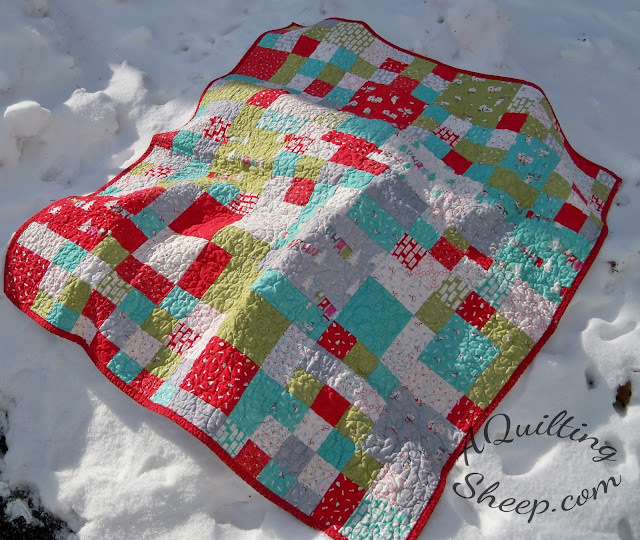 The quilts are gorgeous - such bright fun colors against the snow. I'm hoping to finish a king size postage stamp quilt in 2013. It's been a work in progress for two years now (I'm kinda sick of it). I'm looking forward to seeing it finished. What pretty quilts! Your Christmas sounds perfect to me. I like low key, casual fun with friends & family. Glad you enjoyed your day. I have been busy defining my goals/aspirations for 2013. Check the list out on my blog. In a nutshell I want to participate in several online projects, practice and improve my free-motion quilting and prayerfully pursue a quilt ministry at my church. Enjoy all your quilts. They are so bright, happy and full of life. So happy you enjoyed your Christmas! 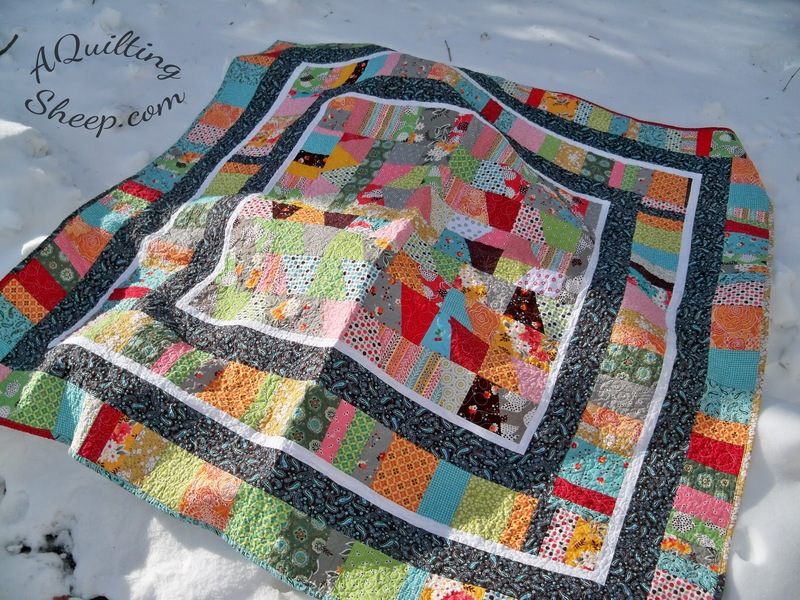 Your quilts look amazing.. again! I think using what we already have is a good goal for the New Year! Cute quilts! My goals are to get a few 'current' (new UFO's) completed this year, and to make the Harry Potter: Project of Doom paperpieced quilt with a blogger buddy.